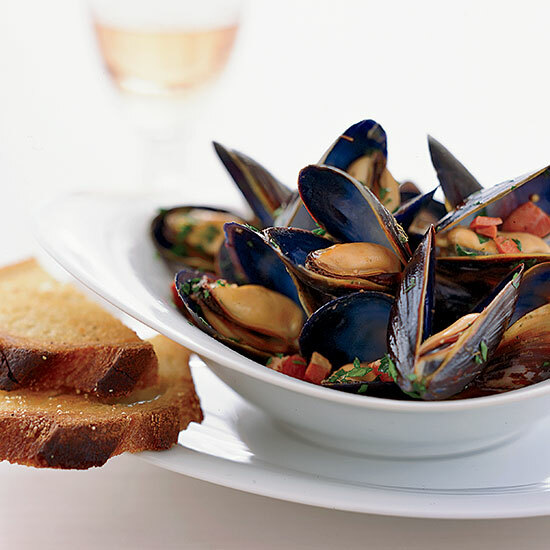 Mussels: Mussels (or clams) can be grown with very little environmental impact, so are a very sustainable seafood. Recipe: At Steve Corry’s Five Fifty-Five in Portland, Maine, mussels from nearby Bangs Island are almost always on the menu. 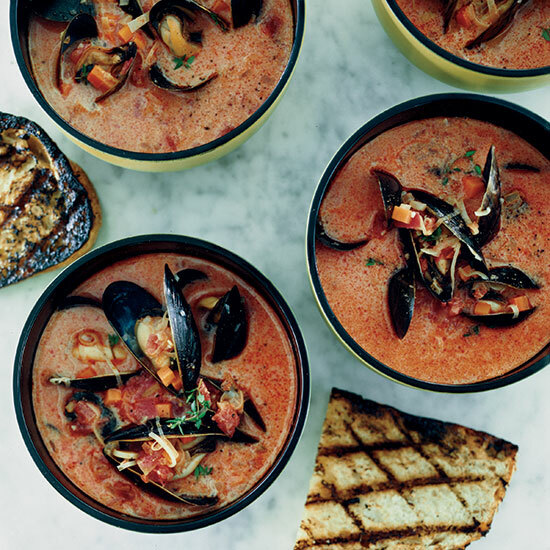 For this Mediterranean-inspired soup, Corry serves the mussels in a brothy liquid with plenty of chorizo. 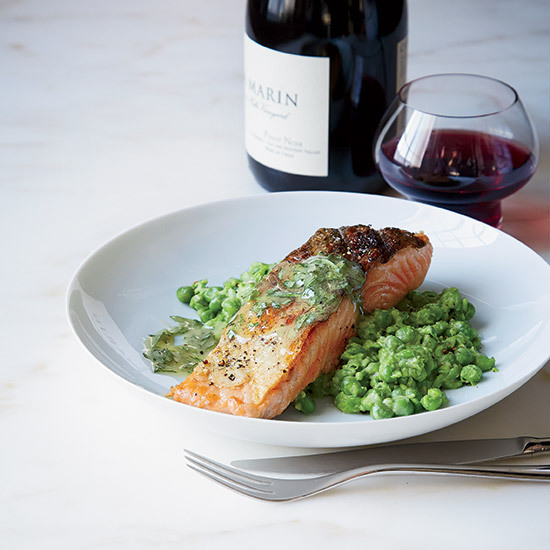 Salmon: All Alaskan wild salmon are sourced from environmentally sound fisheries. 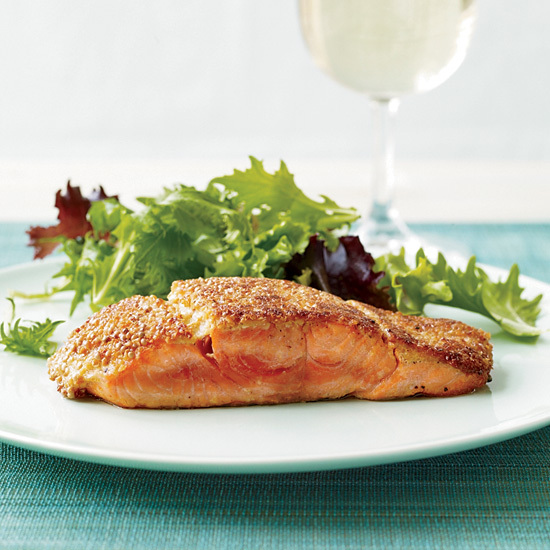 Recipe: F&W's Marcia Kiesel coats fish with Dijon mustard amped up with dry mustard, then dips the fillets into mustard seeds and wheat germ to create a crust. Crab: Dungeness crab is an eco-friendly option, since only full-grown males are caught. 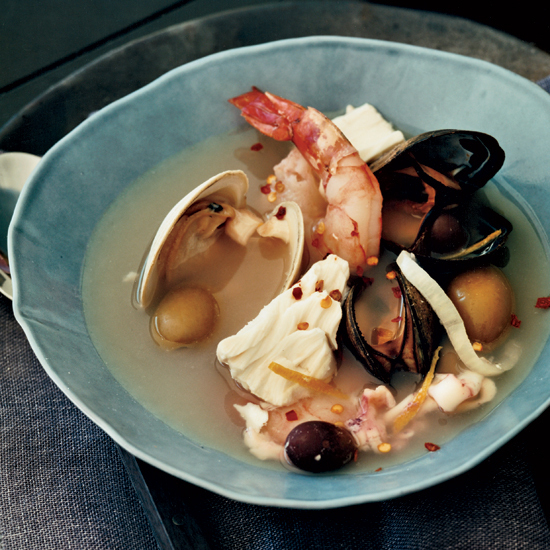 Recipe: Chef Michael Mina’s late mother-in-law always prepared cioppino—the San Francisco seafood stew that owes its origins to fishermen from Italy’s Ligurian coast. Now he carries on the tradition by making her hearty, briny recipe, full of crab, shrimp and clams. 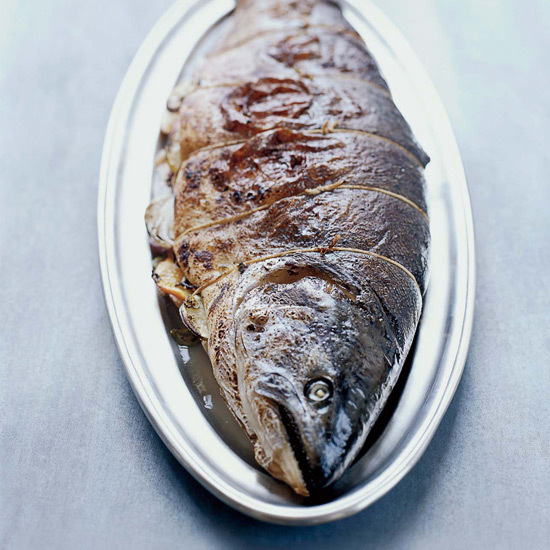 Recipe: Whole fish are usually less expensive than fillets, and the presentation is more impressive. Wild salmon also has a more delicate flavor than farm-raised. Cooking an eight-pound fish might sound intimidating, but it’s surprisingly fast and simple. Mackerel: Choose Atlantic mackerel—it matures so quickly that it has a very plentiful population. 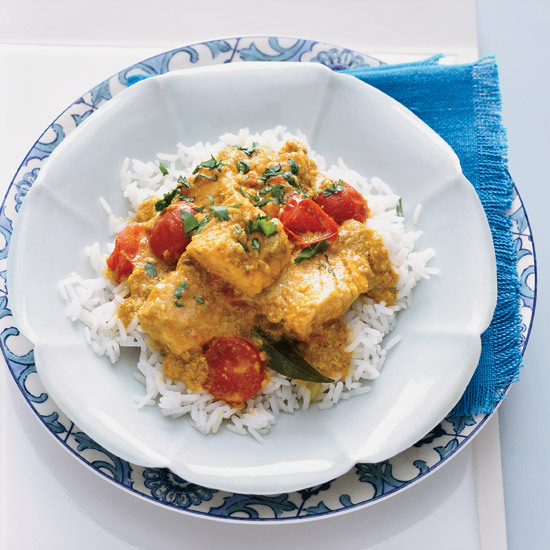 Recipe: Inspired by the cooking of the Malabar coast, this fish curry is tremendously flavorful, thanks to tamarind, coconut, garlic and ginger. Kingfish (a type of mackerel) is traditional, but this recipe calls for salmon, whose richness is delectable with the complex spices. 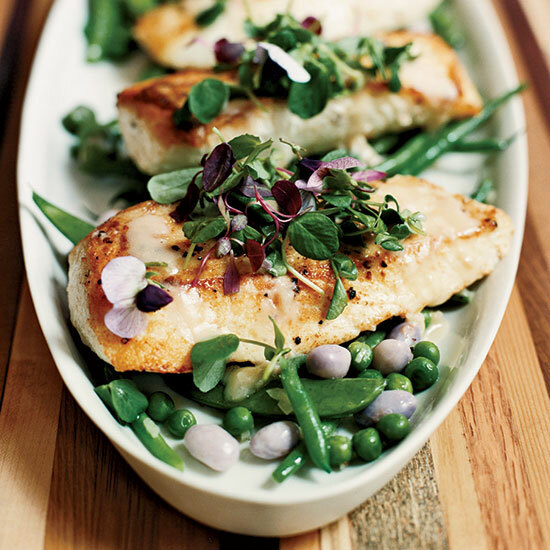 Halibut: Pacific halibut is protected from overfishing, so it makes a good eco-friendly choice. 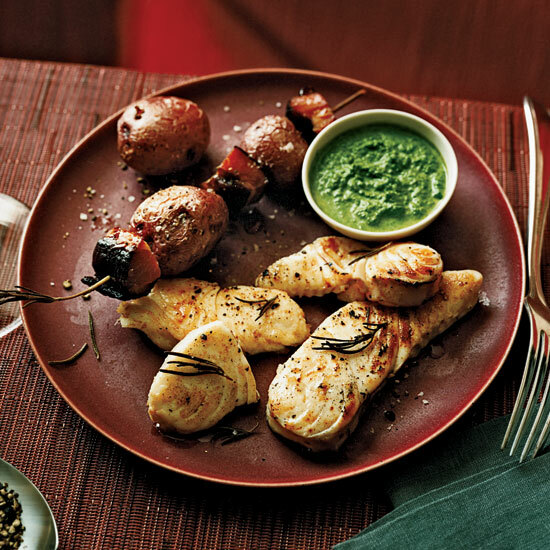 Recipe: Rather than pairing red wine with red meat, opt for perfectly cooked halibut steaks. The bright, lemony parsley sauce balances the earthy quality of a Graves Bordeaux. Bass: Farmed striped bass is raised in ponds or tanks and is a healthy, clean alternative to wild. 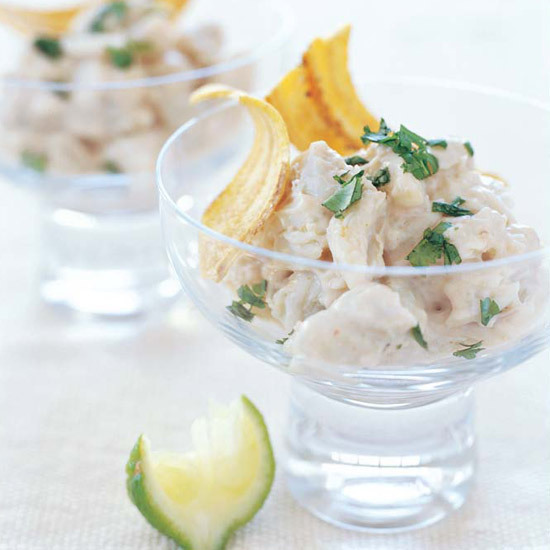 Recipe: Almost everything about this recipe helps make it both delicious and healthy. 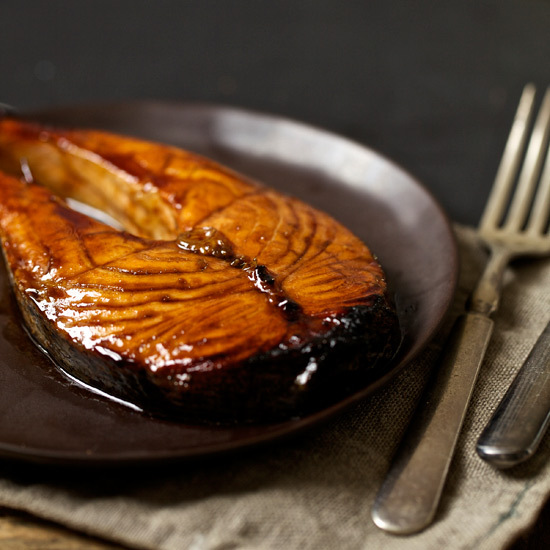 Grilling the plums and fish turns them nicely smoky with almost no added fat. And roasting vegetables en papillote (in a paper or foil pouch) intensifies their taste; more flavor comes from a little tamari. 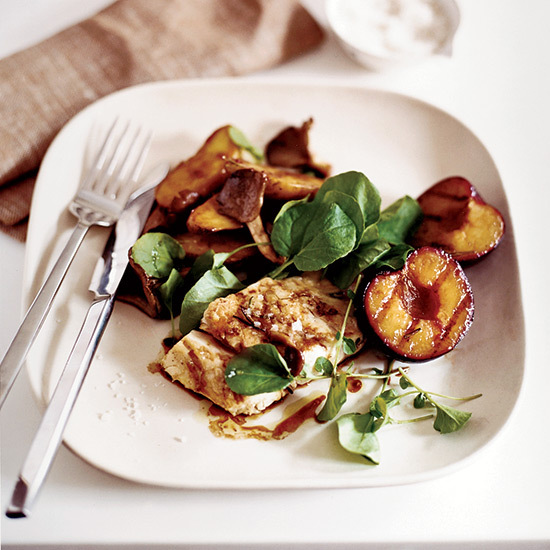 Recipe: “You’ve got to love pan-roasted halibut,” says Dressler’s co-chef Polo Dobkin. Although he and co-chef Cal Elliott don’t usually make a lot of rich sauces, they adore this tangy lemon-butter sauce with fish. Clams: Clams (or mussels) can be grown with very little environmental impact, so are a very sustainable seafood. Recipe: If you prefer to add the clams without their shells and want to avoid the cumbersome process of shucking them raw, steam them in an inch of water or white wine. 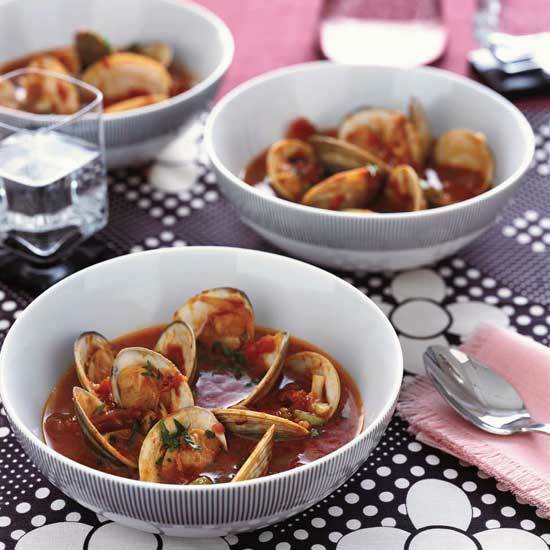 Remove the clams from their shells, and add them to the soup with their steaming liquid. Recipe: You can make the teriyaki glaze in minutes, and the whole dish takes only a little longer. Keep a sharp eye on the salmon during cooking, though; the glaze can burn if the heat’s too high. Recipe: When Bobby Flay is in San Francisco, he gorges on Dungeness crab. Here he combines morsels of sweet crab with Asian flavors—lush coconut milk, piquant lime juice and aromatic cilantro—then serves it with salty chips. Recipe: "Give mackerel a chance," begs Michael White. 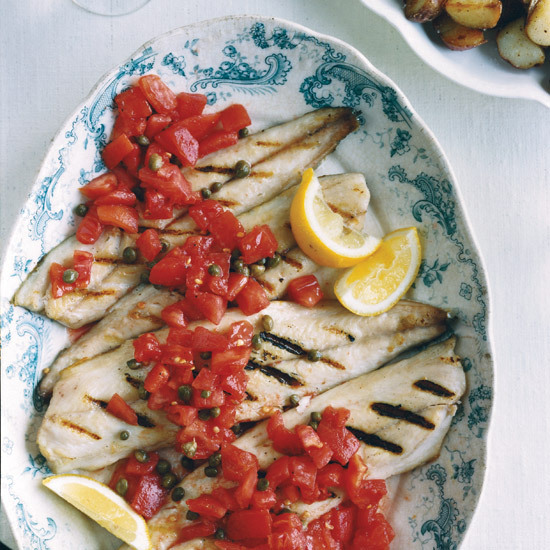 The Spanish fish he imports from Europe is grilled, which makes the skin enticingly crisp, then topped with a refreshing tomato-caper salsa. Recipe: Ethan Stowell loves mussels all year round, but he’s particularly fond of the plump summer ones from Washington’s Puget Sound. Here he flavors the briny mussels with lemon juice, fresh herbs and speck, the salty cured ham. 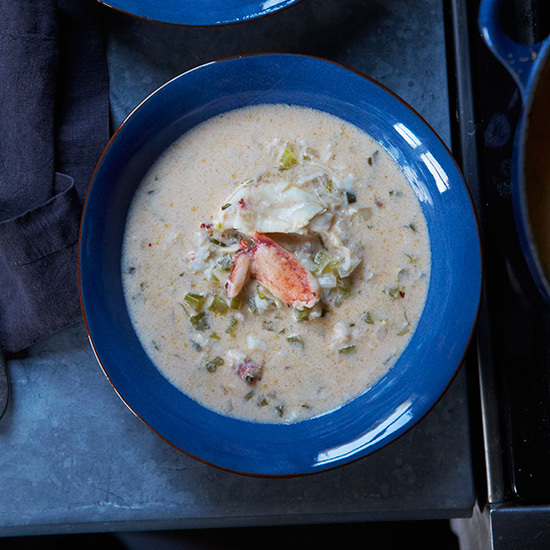 Recipe: Tanya Holland's decadent crab bisque is studded with plenty of lump crabmeat. Thanks to a hit of cayenne and Tabasco, the soup has a sneaky heat. 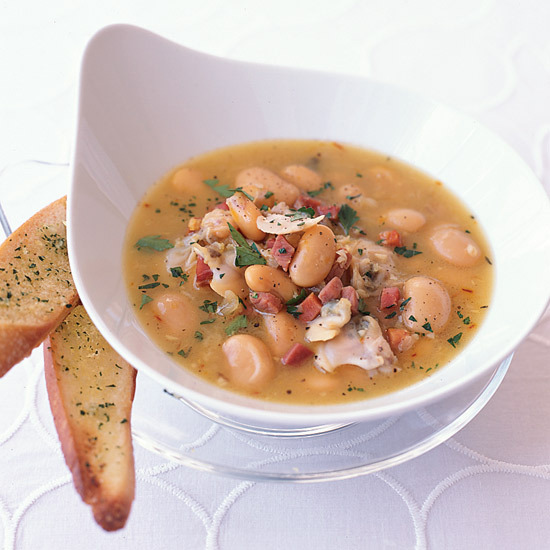 Recipe: Steaming keeps fish moist and couldn’t be quicker. 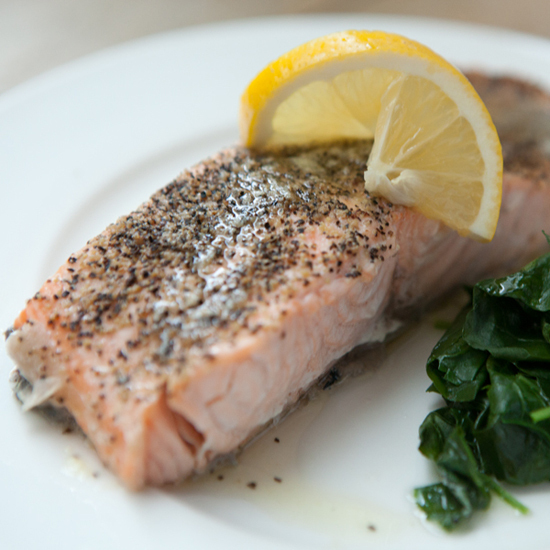 Here watercress is steamed with the salmon, and both benefit from a spoonful of lemon butter. You could use olive oil instead of the butter, however, or just serve lemon wedges. 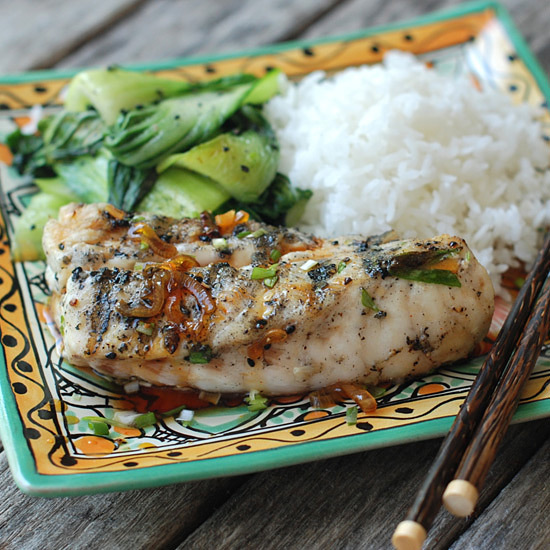 Recipe: This hot-and-sweet, Asian-inspired dish from chef Andrew Zimmern pairs an easy but flavorful marinade for grilled fish with an intense, savory caramel sauce. Recipe: As an alternative to smoky (and fatty) chorizo, try soyrizo (available at melissas.com), a soy-based vegetarian sausage. 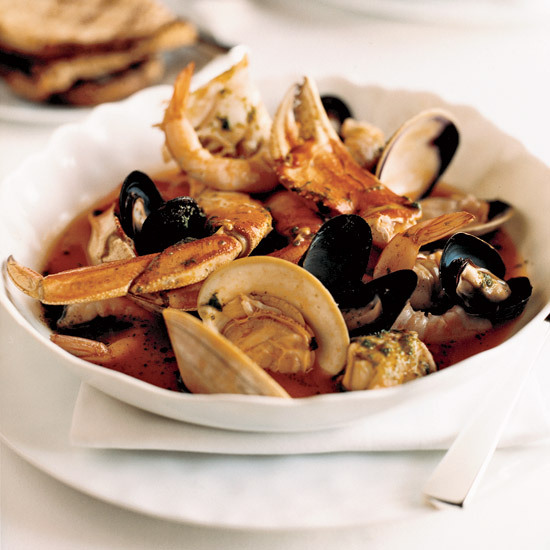 Clams & Mussels: Clams and mussels can be grown with very little environmental impact, so are a very sustainable seafood. Recipe: Chef Richard Betts freely adapts the recipe to whatever looks best at the market, but he always follows the same formula: fish on the bottom, shellfish on the top. Recipe: Chef Gerardo Valenzuela uses seafood in dishes that can pair beautifully with whites and reds. 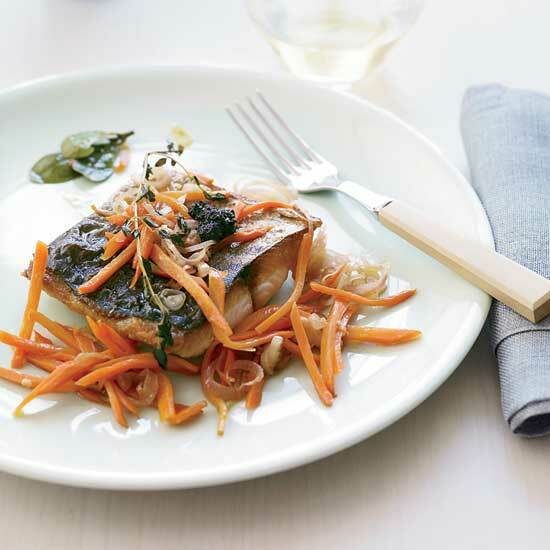 Recipe: In this light dish, chef David Swain marinates fish fillets in red wine vinegar and olive oil along with tender carrots and shallots.